Not available to groups under age 25 - NO Prom Groups Escape to the splendor of a dramatic bay front retreat. Perfect for two families. Located in the pristine town of Loveladies Harbor. Three blocks from beach access. Pass provided to large parking lot at beach exclusive to Loveladies Harbor. 5 bdrm, 5 baths, linens provided! sleeps 10-14. 45' dock with power & water. Contemporary style home with ramps for those who do not cope well with steps. Large deck & patio areas on water for great entertaining. This home is charming in it's decor, offering a living area for seating of 11 people and a new American Leather King Sleeper sofa with memory foam mattress. (Rated # 1 in the world!) Watch a 41 inch plasma TV, high speed Internet, fireplace. A Fully equipped kitchen and dining area located on the first floor with a desk. 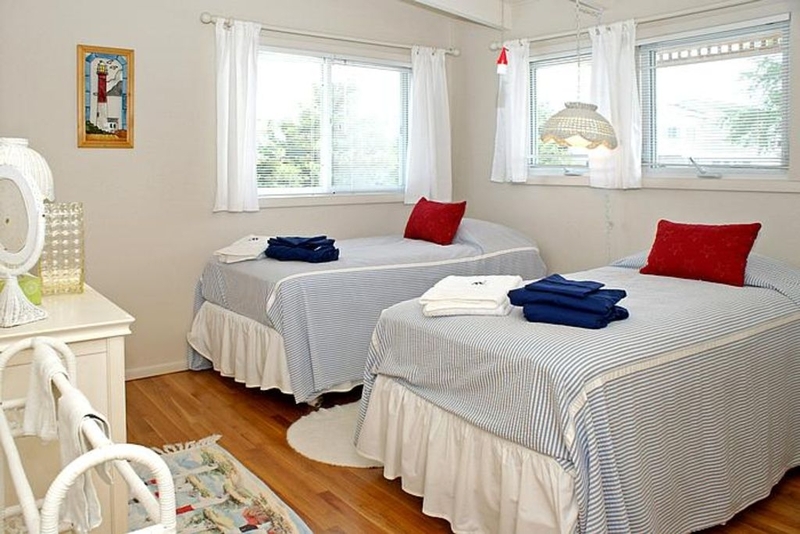 Also located on the first floor is a laundry room, full guest bath, powder room, queen bedroom and a twin bedroom. There is also a wet bar for your entertaining delights. The magic of this home is found in the location. 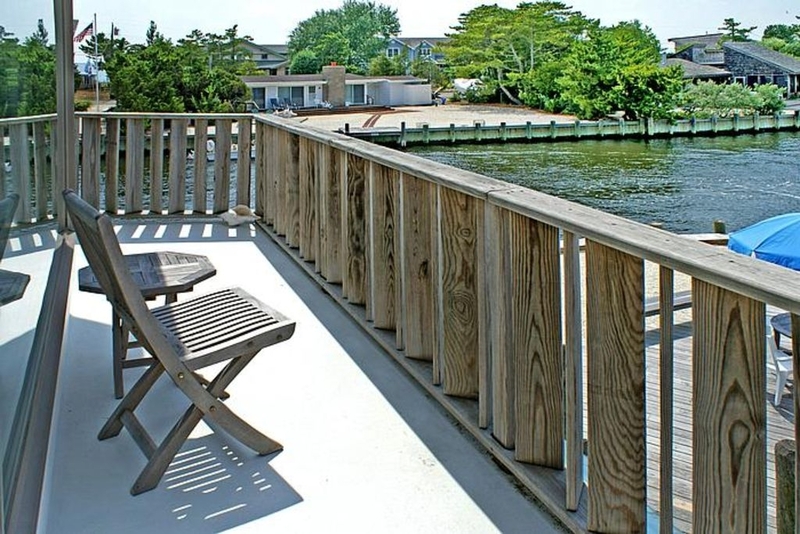 The water views that are offered from the living area, and outside decks are breathtaking. Outside you will find large open space with multiple seating areas to dine and lounge by the water. 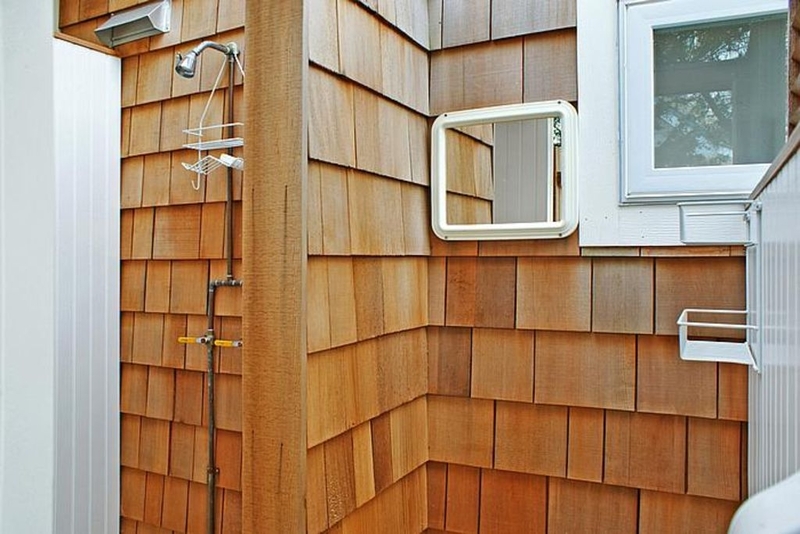 There is a grill for your outdoor cooking and a new outdoor shower. This home also has an additional seating area by the bar with a sofa for lounging or reading a good book. The home has new hardwood floors through out. 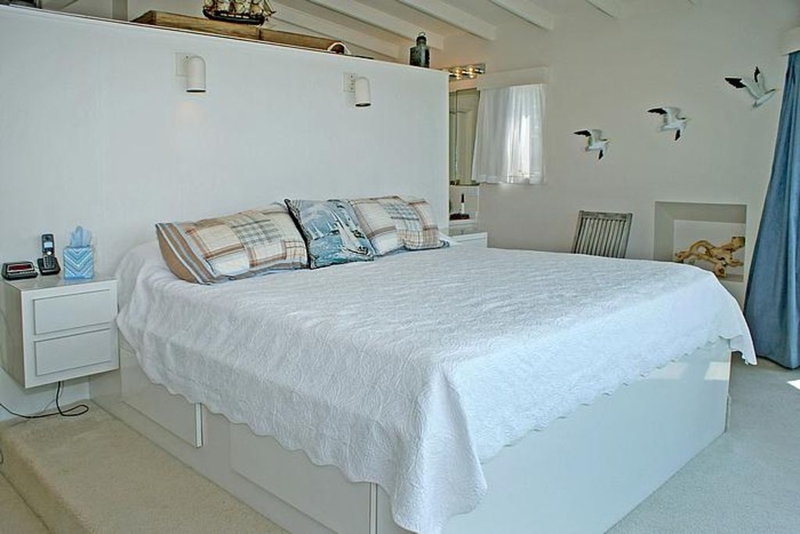 The exposed beams have been painted white to give that true Nantucket feel that you would find in a beach home. The bar has seating for up to 6 that looks out onto the lagoon. Beautiful views are to be had from every where you look out of the windows. Master bedroom has a separate entrance by way of a staircase located on the bay side of the home. 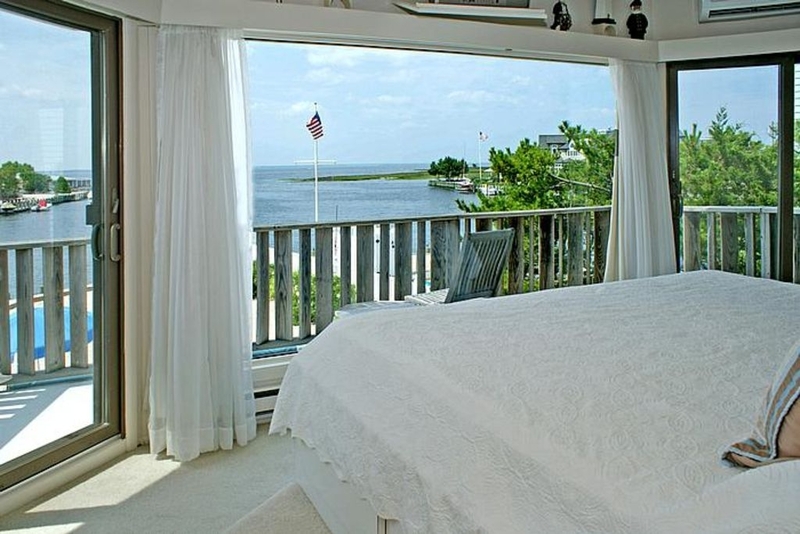 This is the only bedroom located on the top floor that has a balcony overlooking the the bay. The views from this room are breath taking. This room has a king bed looking out to the bay and has been designed with a floating wall that does not go to the ceiling. The bed is on the front and behind built into the wall is multiple sets of drawers and cabinets. It is very unique in it's design and offers a great amount of storage. The room also has a large mirrored double closet. 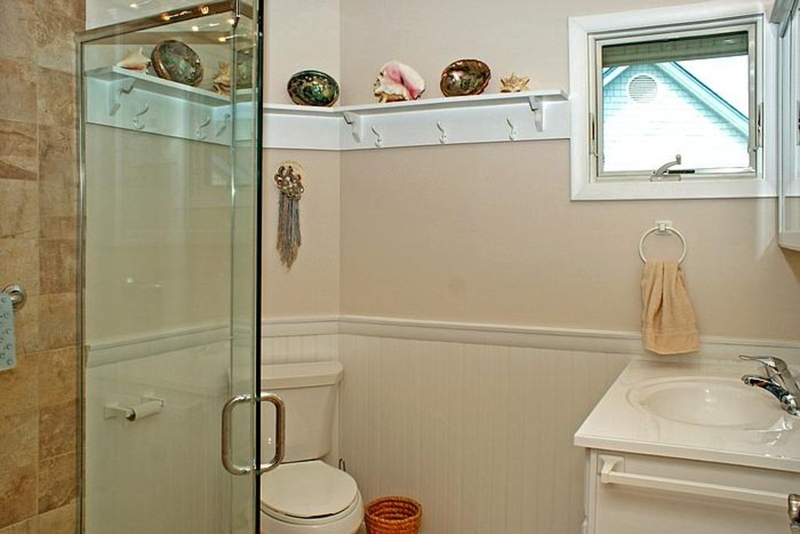 The bathroom area is located behind the wall with a water closet and shower. This room has a new ductless central air system that keeps the room very cool on those hot days in the summer. You can even lay back in bed and watch TV. On the other side of the house the staircase takes you to the new addition with 2 bedrooms. One bedroom has a queen bed and the other has a set of twin beds. This section of the house has central air. 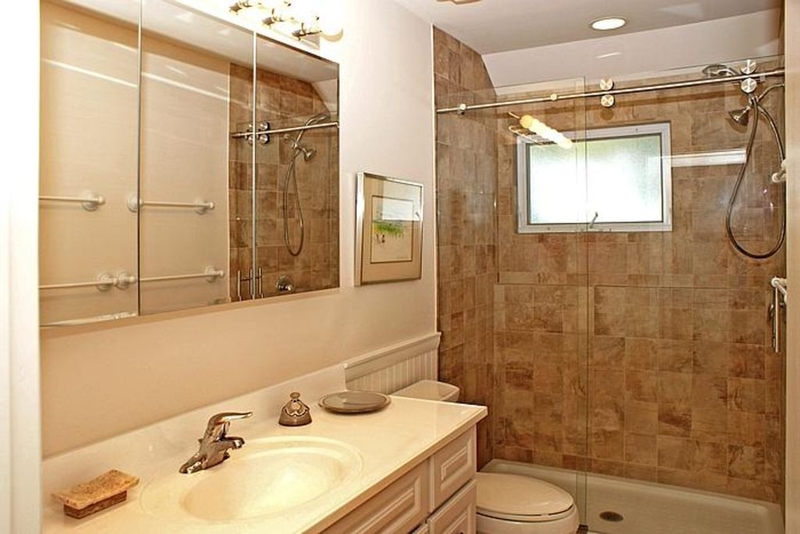 There is a full bathroom on this floor with a shower. The owner just completed a large bonus room perfect for the kids to play. A large sectional is located in this room with a queen sleeper. 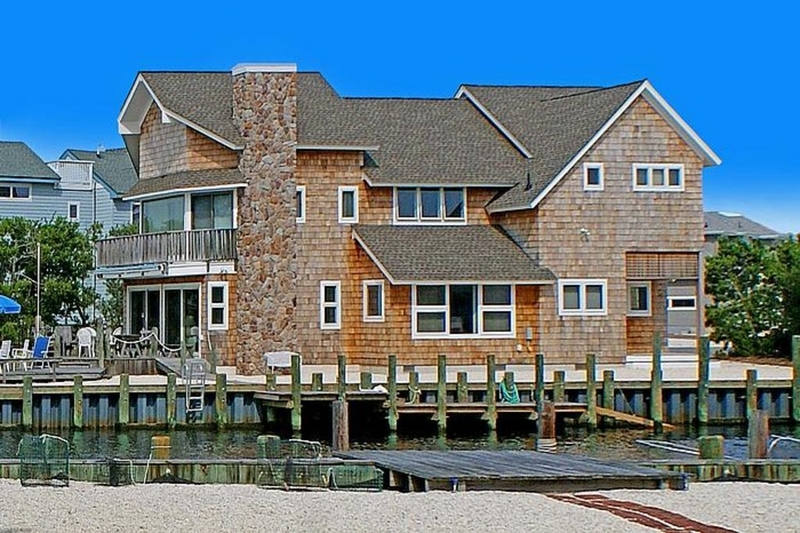 The home is perfect for families looking to make great memories at a waterfront home. Follow 72 East to Long Beach Blvd. Make a left. Loveladies is an exclusive section of Long Beach Island. With less traffic and congestion from the other townships located on the island. The property sits on the point on Laguna lane where you can enjoy the most incredible sunsets from your living room. 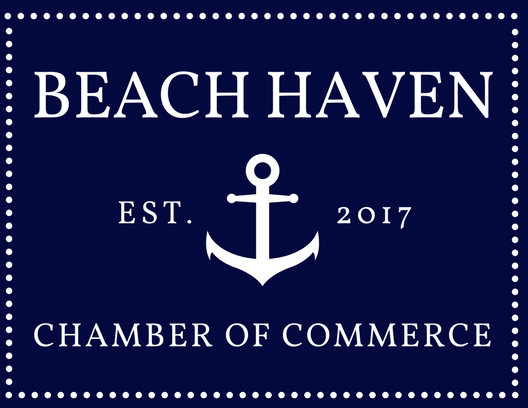 Other Activities: amusement parks located on island, great shopping and dining, fishing and tour the Barnegat Lighthouse and museum. House , 41,979.25 sq. f.
Large home in a perfect location. Access to the ocean beach is provided as well as badges. I really appreciated the fact that the owner took care of renting linens and towels. Great home for two families. The accommodations and the lagoon front location were excellent. The sunsets were spectacular. - linens and bath towels ARE provided. - the large upstairs room does not have AC; we used the provided fans but a small AC unit would have made it more comfortable. My family and I rented this property at the end of the summer. The best part of the house was its location and beautiful sunsets. The lagoon provided a lot of entertainment for the kids and adults. We kayaked (we rented them from Ron Jon), fished and swam. The beach was a short walk away. The parking pass gave us the option to drive up if we wanted to and the beach passes were a bonus. The house was perfectly set up for the family to gather and have space to spread out as well. Loveladies is a quiet town and the perfect setting for a low key, relaxing vacation. I would recommend this property for a relaxing family vacation. This property was a very convent place to have a family vacation, and two dogs. Spacious, well kept, and had everything we needed to enjoy our week stay. Although there was no pool, swimming was allowed in the bay and we were able to fish in the bay. The manager met us upon our arrival to make sure everything was in order. I would recommend this property for a nice relaxing vacation. I would recommend to provide kayaks or large tubs to be available to be used in the bay. The house was just perfect for my family. We loved the location right on the bay and it was close enough to shopping but not a congested area. My husband and I look forward to going back in the winter just the two of us with our dogs. We loved the fact that pets are allowed and our pups loved being near the water. This home is the perfect place to have a wonderful vacation. Situated at the end of a lane in Loveladies Marina, the location provided a quiet and undisturbed atmosphere to relax and unwind. The views from the home are INCREDIBLE! Accommodations such as the master suite, wet bar and 8 beach badges were much appreciated. Having an open, spacious floor plan along with bedrooms and a walk in shower on the ground floor were perfect for my parents who "don't do stairs" anymore. Having the option of central air conditioning was appreciated but not needed because with all of the windows, there was a breeze regardless of the wind direction ! The ADMS property management group were professional, friendly and responsive to my communications. This beautiful home is highly recommended and we look forward to returning ! The property is beautiful and amazing with all the comforts of home (and then some). The photos do not do the property justice! The neighborhood is extremely quiet and relaxing, which adds to the instant relaxation you feel when you arrive. It was a perfect property for my husband and son to fish, crab and enjoy the outdoors - while I enjoyed the deck and the wonderful views! Even our dogs enjoyed the vacation! Can't wait to visit again! Perfect Vacation Home in Loveladies! We were pleasantly surprised when we arrived at this beautiful lagoon front home. The home is spacious with plenty of room to spread out. It's decor is comfortable with plenty of seating for all. The beds were so comfortable, we felt like we were home. The view from the master bedroom is exquisite. The views from the other decks are magnificent and the sunsets made happy hour so pretty. The dock is perfect for bringing your boat, Ours was about 23 FT long and had plenty of room for more. We went fishing and crabbing and made a delicious dinner of stuffed flounder with the crab. The kitchen has plenty of pots and pans for all your needs. The house comes with 8 beach badges which was a very thoughtful touch because the beach badge checkers do come around every afternoon. The beach isn't a far walk but the parking pass comes in handy for piling in the chairs and beach stuff. Our whole family enjoyed this home very much and would definitely come back. OUR FAMILY COMPLETELY ENJOYED OUR VACATION IN Loveladies. an outstanding view of the bay... both in the mornings and in the evenings. Also, any property issues were quickly resolved by management. We enjoyed being able to be outdoors for cooking and dining (CRAB FEST) as well as indoors for visiting and game playing. Many fine restaurants were close by if we wanted to have a "date night" out. Great seafood offerings. Hope to bring even more family members to Loveladies next year. P.S. The beaches are beautiful, too.